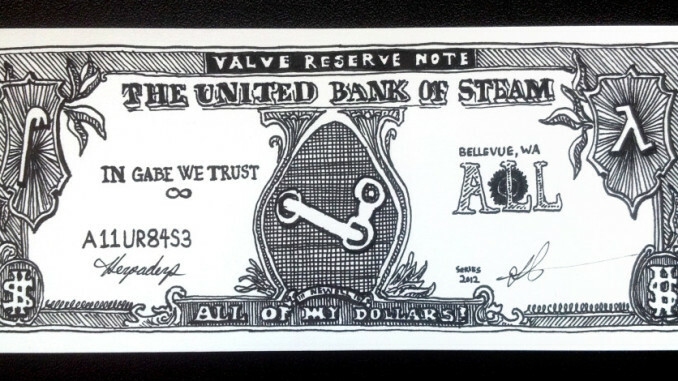 Another Steam Sale has come and gone and this time Valve really did a number on my wallet. 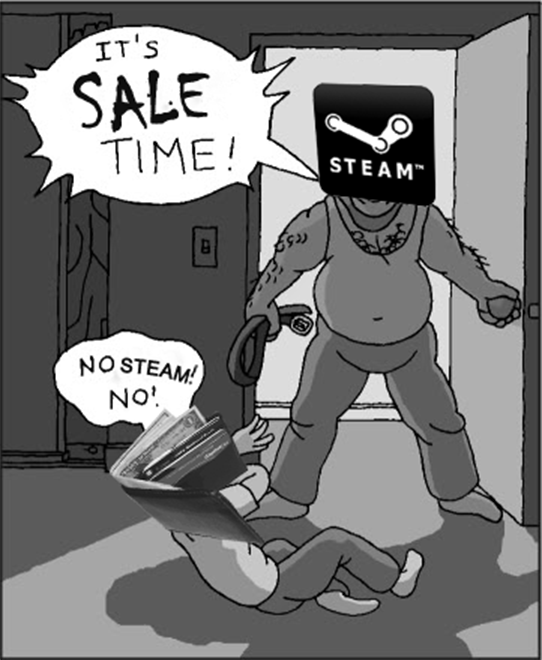 During the previous Steam Sale, a friend and I were patting each other on the back for not giving into temptation. 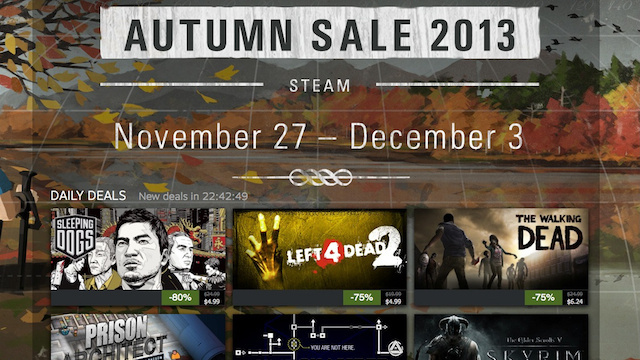 For two weeks we avoided purchasing games we would have only halfheartedly played, for prices which make buying games at any other time of the year seems down right fiscally irresponsible. But this time around I just couldn’t help myself. Every day I logged on only to find some gem that I just had to have in my collection and here it was, being offered at prices that I would equate to real world purchases and deem totally acceptable. Castlevania: Lords of Darkness for the price of a burger and fries? (now $40) Of course! Assassin’s Creed 3 for the cost of a cup of joe? (now $30) Naturally! Fez or a bottle of soda? (now $10) Well, duh! Each comparison I made seemed like perfect justification for making over a dozen impulse purchases during that feverish week. Raindrops filled the oceans after all. Now the dust has settled and I am left with probably fifteen brand new games. Each of their individual price tags were small, between $1 and $10, but the costs added up eventually. Raindrops filled the oceans after all. Now I can’t bring myself to play any one of them. I am crippled by options. I find myself launching one game only to wish I were playing another one before I even get passed the Nvidia splash screen. I think back to the “good old days” when I was lucky to even have a new game at all and wonder why I seem to draw as much or more enjoyment from reminiscing about games of yore than I do from actually playing the ones I just bought. That’s when I realized I’ve become a Prisoner of Choice. I joked a few months ago about how I didn’t consider myself a gamer anymore but more of a game collector. After all, I spend significantly less time playing games these days then I did in my youth. With the responsibilities of real life cutting into my free time, when I do get the opportunity to play, I instead opt to fill my empty hours with other sedentary entertainment like re-watching Farscape on Netflix (finally) or reading my 24th of the 65 or so Stephen King novels in print. So if I don’t game as regularly, what compels me to keep buying more games knowing intellectually that I won’t have the time or the dedication to play them all? I think the answer is actually primal and biological in nature. An ancient trait predating civilization, passed down through the generations going all the way back to my simple furry ancestors. I am a mammal hoarding entertainment like a squirrel hides nuts; saving up for some winter whose arrival is unforeseeable but looms perpetually on the horizon. …hoarding entertainment like a squirrel hides nuts; saving up for some winter whose arrival is unforeseeable but looms perpetually on the horizon. It’s a foolish thought, but it’s present nonetheless. If the stock market were to crash tomorrow and money became worthless at least I would have a fresh batch of games to play. While roving bands of thugs and looters rioted in the streets calling for the downfall of the establishment and families of four worried about where their next meal was coming from, I would be comfortable in the knowledge that should I desire to play a game, I’ll have options readily available to satisfy that craving. Yes, I guess by strict definition, I am. I love games. I love talking about them, thinking about them, writing about them and even dabbling in making them. I can’t help but want, Want, WANT! Even when there is no logical need for more. Now looking at the little crater mark shaped dip in my savings displayed by graphs on my online bank statement, I can’t help but feel shame for how foolishly I’ve acted. 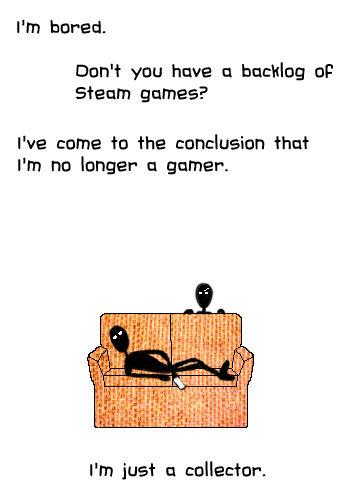 I didn’t need all those games, not that many and not now. By the time I want to play one of those games it will probably be available, for a more than reasonable price, months or even years down the line when I finally, organically get around to playing it. Maybe my future self will thank me for buying all these games, but alas I doubt it because I am already my future self. 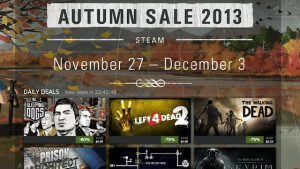 Twelve months ago I must have went on another of these mini shopping sprees during another one of Steam’s drug pushes Sales, because I have plenty of games in my library already that I haven’t finished, some I’ve barely touched and some I swear I couldn’t tell you what they are or how they got there. In all things it seems the key to happiness is balance & moderation. Perhaps this public admission of my haphazard spending of late will help to assuage my guilt and serve as a warning to someone else out there who very soon will be tempted to just start throwing money at that empty part in themselves, which we all posses. It’s a black hole called Boredom which can never be plugged. We try to stop it up, if only temporarily, but it’s a herculean labor that will forever be endeavored in vain. In all things it seems the key to happiness is balance & moderation. It’s a quality so crucial to our well-being yet seemingly alien and unnatural to the human race as a whole. I shouldn’t spend more money on games than I do on food, yet last month I did.